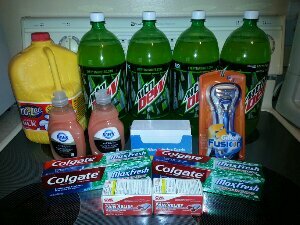 This week at CVS I spent $8.34 and saved $38.71 and I bought a lot of things we were out of. I save the most by rolling my ECBs (CVS store dollars) by buying something, getting the ECBs, and using them to pay for the next transaction. The Mountain Dew is extra caffeine to get us through finals week. I did 3 transactions on my card and used the bf’s card to get another pain reliever for free (they had tons of them at my store). If you would like to see the deals for this week I visited SouthernSavers.com.